Benjamin Kane Ethridge's fiction has appeared in Doorways Magazine, Dark Recesses, FearZone, and others. His occult fantasy novel BLACK & ORANGE was published on Halloween by Bad Moon Books. He also wrote a master's thesis entitled, "CAUSES OF UNEASE: The Rhetoric of Horror Fiction and Film." Available in an ivory tower near you. Ben lives in Southern California with his family. When he isn't writing, reading, videogaming, he's defending California's waterways and sewers from pollution. Benjamin Kane Ethridge is a LibraryThing Author, an author who lists their personal library on LibraryThing. 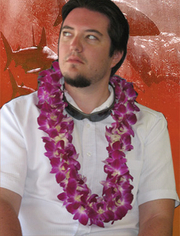 Benjamin Kane Ethridge's book Bottled Abyss was available from LibraryThing Early Reviewers. Benjamin Kane Ethridge's book Divine Scream was available from LibraryThing Early Reviewers. Benjamin Kane Ethridge's book Nightmare Ballad was available from LibraryThing Early Reviewers. Benjamin Kane Ethridge's book Limbus, Inc. was available from LibraryThing Early Reviewers. Benjamin Kane Ethridge's book NOMADS was available from LibraryThing Member Giveaway. Benjamin Kane Ethridge's book Dungeon Brain was available from LibraryThing Member Giveaway. Benjamin Kane Ethridge's book Bottled Abyss was available from LibraryThing Member Giveaway. Benjamin Kane Ethridge's book Black & Orange was available from LibraryThing Member Giveaway. Benjamin Kane Ethridge is currently considered a "single author." If one or more works are by a distinct, homonymous authors, go ahead and split the author. Benjamin Kane Ethridge is composed of 2 names. You can examine and separate out names.